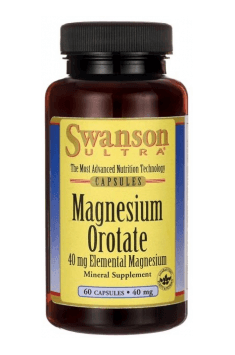 Swanson Magnesium Orotate is a dietary supplement containing highly assimilable magnesium in the form of magnesium orotate. Magnesium is one of the most important elements in the human organism that affects the proper functioning of the entire body. Magnesium orotate is a combination of magnesium with orotic acid, which is found naturally in the human organism, as it forms DNA. Thanks to its ability to permeate cell membranes, orotate efficiently increases the assimilability of magnesium. Orotates can increase mineral bioavailability by 20%, thanks to which lower doses of magnesium become sufficient. Magnesium orotate seems to be one of the most assimilable forms of magnesium available. Magnesium is an incredibly important element in the organism and although its amount in the body seems rather low (about 0.1% of body composition), it is the fourth most prevalent element in the system. It participates in over 300 enzymatic reactions, including crucial energy transformations and the synthesis of DNA and RNA. It is estimated that magnesium is currently one of the most deficient elements in the body. High amounts of the mineral can be found in grains, nuts, pumpkin seeds, legumes, cocoa, and spinach. Magnesium deficiency in the diet can manifest itself through, for example, eye twitching and muscle cramps, irritability, depression, dizziness, muscle weakness, heart rate disorders, sleep and concentration disorders, or improper blood sugar concentration. Low magnesium levels are connected with the deterioration of cognitive functions and sleep quality. Maintaining the plasticity of synapses requires the right amount of magnesium in the cerebrospinal fluid. It improves communication between neurons and is essential for the normal functioning of the enzymes responsible for memory and the functioning of brain cells. Magnesium regulates the permeation of calcium to cells in the organism, so its insufficient amount can lead to excessive calcium inflow in cells. Too high levels of calcium in cells, on the other hand, are toxic and can lead to damage and inflammation. It has been demonstrated that supplementation with magnesium can reduce the levels of cortisol and catecholamines, which reduce magnesium levels in the organism. A deficiency of the element can contribute to irritability and high susceptibility to stress. It has been noted that low magnesium levels are observed in people with symptoms of depression, regardless of their age or ethnic group. Magnesium participates in the process of the formation of high-energy compounds in the organism, such as adenosine triphosphate (ATP). It is incredibly important for athletes, as it ensures proper neurotransmission and muscle contractility as well as reduces tiredness. A positive effect of magnesium has been shown on physical capacity as well. Moreover, supplementation with magnesium can help people struggling with chronic fatigue. Energy production takes place in the mitochondria, and its side effect are free radicals. Normally functioning mitochondria can manage free radicals but insufficient magnesium levels can lead to their distorted functioning. Disorders in mitochondrial function contribute to high free radical levels in the organism and, as a result, to the occurrence of negative effects connected with, for example, damaged cell membranes. Chronic inflammations are a cause of many diseases. Research on rodents has shown that specimens on a low-magnesium diet had much higher lymphocyte and macrophage levels and displayed increased production of cytokines and free radicals. All markers went back to normal after a few days of supplementation with magnesium. Moreover, magnesium levels are reversely correlated with the level of the C-reactive protein (CRP), that is an acute-phase protein formed in response to inflammation in the organism. CRP has a pro-inflammatory effect on cells in capillaries and reduces the release of nitric oxide (NO), which can contribute to the development of circulatory system diseases. The use of magnesium improves the contractility of the cardiac muscle and can reduce the risk of arrhythmia. Magnesium can reduce arterial blood pressure by dilating blood vessels and inhibits platelet aggregation, which reduces the risk of cardiovascular diseases. Magnesium improves insulin sensitivity in tissues, that way helping to reduce blood glucose levels. It can also reduce the level of fasting insulin and glycated haemoglobin, that is a parameter demonstrating average glucose levels over time. About half of the magnesium found in the human body is located in bones. It is essential for maintaining their proper density, and its high levels prevent osteoporosis. Magnesium also stimulates the thyroid and parathyroid glands to produce calcitonin and parathormone, which control calcium and phosphorus management in the body. What is more, the element is essential for the formation of the active form of vitamin D, calcitriol, which participates in the formation and maintenance of a strong skeletal system. Magnesium participates in the assimilation of essential elements, such as calcium, potassium, phosphorus, and sodium. Along with magnesium, they are minerals essential for life that determine the normal functioning of the entire organism. To sum up, Swanson Magnesium Orotate is a dietary supplement containing a highly assimilable form of magnesium. The preparation can help to supplement magnesium levels in the organism. It helps to improve cognitive functions, supports the right functioning of the cardiovascular system, improves glucose tolerance, and reduces the symptoms of anxiety and depression.